Pastor Justin is the Associate College Pastor at Augsburg College and is an excellent mentor to our students preparing for ministry. 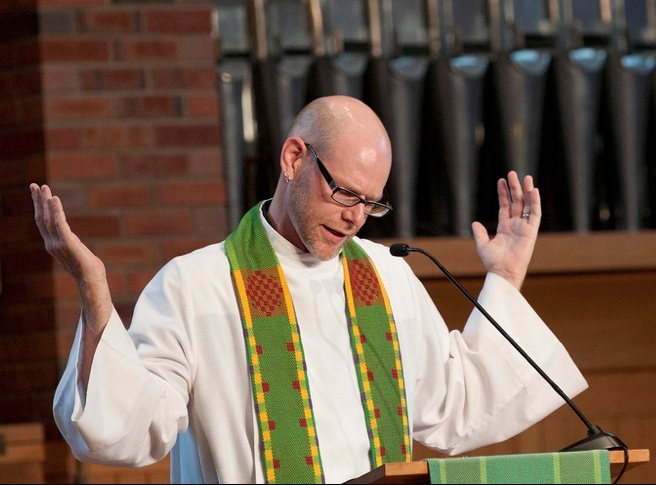 He has been serving at Augsburg College since August of 2013. Justin received his Master of Divinity from Luther Seminary in St. Paul and his Doctor of Ministry from Columbia Theological Seminary in Decatur, Georgia. Justin is passionate about liturgical studies, preaching, social justice issues, and the power of biblical metaphors in the lives of the people of God. When not working with the wonderfully talented Campus Ministry staff at Augsburg, Justin can be found spending time with his family, cooking, reading, drinking coffee, watching sports and an occasional movie, and fly fishing for steelhead and trout. I have to confess that I haven’t always been a fan of children’s sermons. I questioned their efficacy and wondered if they were more of a distraction from worship than a component of worship. It is a challenge to teach/preach to a cadre of kids in a few minutes without sinking into the mire of moralistic mantras. Or, on the other side of sermonic spectrum, fall into the trap of sharing a message every week with the children that inevitably ended with, “Jesus loves you!” Incidentally, the latter was often the case for me! In addition to content liability, there is an unspoken pressure to be funny or cute with the children so as to keep the listening adults of the assembly entertained. I suppose this was the piece that bothered me most. I have said more than once, “We don’t call all the worshippers over 65 years forward, make them sit on the floor, ask them questions that test their bible acumen, and then laugh at them when they summon the courage to speak.” I’m not sure this was the best argument for dropping children’s messages from the liturgy, but I have seen many kids physically deflate when their earnest responses conjure the cackles of the congregation. Worship leaders, Sunday teachers, youth minsters, and pastors must be careful not to unintentionally and ever so publically shame our children. For many reasons, then, I have tried to worm my way out of delivering children’s sermons. But then I had children of my own and I began to see worship through their eyes! My kids thoroughly enjoy the children’s messages at our congregation, and not just because their dad is NOT delivering them (but that may be part of it too!). One of the many joys of my call as the associate pastor at Augsburg College is the fact that Sunday mornings are without pastoral duties on campus. Thus, I am able to worship with my family as a parishioner in the pew at our home congregation. Children’s messages are no longer my responsibility. The pastors, diaconal minister, high school students, and other adults who give the children’s messages at my congregation do an outstanding job! They create a welcome environment, are sensitive to the needs of the children, teach on a plethora of topics (though, Jesus’ love for them is often emphasized as it should be! ), and instill in the kids a sense of belonging in worship. My children enthusiastically scamper to the center of our worship space when beckoned to receive a word of God for them. Over the past few years, my appreciation for children’s sermons has grown. My home congregation has one every single week, no matter what. It is one of the many ways that they communicate full welcome and participation of children throughout the entire service. And it speaks volumes to children about their own place in the midst of worshiping assembly. I fully realized this last month when my grandfather died. Without question, our three children (ages 6, 4, and 1) were going to be in worship at my grandfather’s funeral in rural Minnesota. As a family and as people of faith, we needed to grieve and worship God together! Two days before the funeral, I was explaining the funeral worship service to my two older daughters. After hearing about the casket, how there would be singing, bible readings, and the fact that our whole family would be together at my grandfather’s church, my eldest daughter immediately asked, “Is there going to be a children’s sermon?” I was floored. I never thought about having a children’s sermon at a funeral before. Not once. And I think about funeral liturgies a lot! Her question serves as a testimony to me of the import of children’s messages in the lives of the young believers in our communities of faith.